NASHVILLE, Tenn. (AP) Tennessee Titans tight end Delanie Walker says he and his family have received death threats since he told fans not to come to games if they felt disrespected by NFL players’ protests. The Pro Bowl tight end shared the ”heartbreaking” threats Thursday night in a social media post. 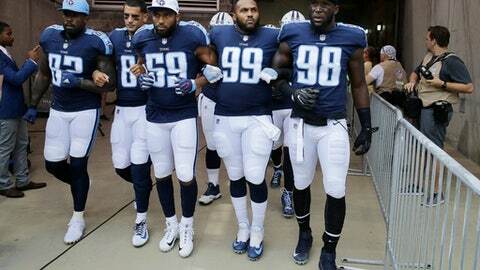 Walker and the Tennessee Titans joined the Seattle Seahawks in staying inside their locker rooms during the national anthem last weekend, and Walker walked out arm in arm with quarterback Marcus Mariota. On Monday, Walker tried to make clear he supports the military in a protest that is seeking equal rights. The Titans had no comment Thursday night. Walker took part this spring in the NFL’s USO Tour of the Middle East. He said in his statement he gained an even greater appreciation for the men and women who defend American values. He said he used strong words in defending the Titans’ right to make their own choices. He wrote that it’s his choice to try to spark conversation for positive change and fans’ choice to attend Titans’ games, a U.S. freedom so envied around the world. ”I am proud to represent the many faces of Titans fans and believe that only through a more respectful discourse can we achieves the goals of unity, peace and racial equality that I know we all strive for,” Walker said. Walker isn’t the only NFL player dealing with a backlash from protesting. Detroit Lions defensive tackle Akeem Spence shared on Twitter earlier Thursday that his father, a contractor, was denied a job on a house due to his protest. He was among the Lions who took a knee before their game against Atlanta.